Belonging to our Figure Series line of high quality acrylic paints this set of six colors have been designed to offer optimal coverage when applied by brush. This set has been developed to paint the field grey uniforms of WW2 German soldiers. Field grey was widely used throughout the various uniforms of the Wehrmacht, Fallschirmjagger (Paratroopers) and others troops, such as tank crews, and Special Forces. Inside are six basic colors for these uniforms, all of which can be blended with each other to achieve different colors and shades like the originals in that era. These paints offer the perfect balance between fusion of colors, opacity and intensity. 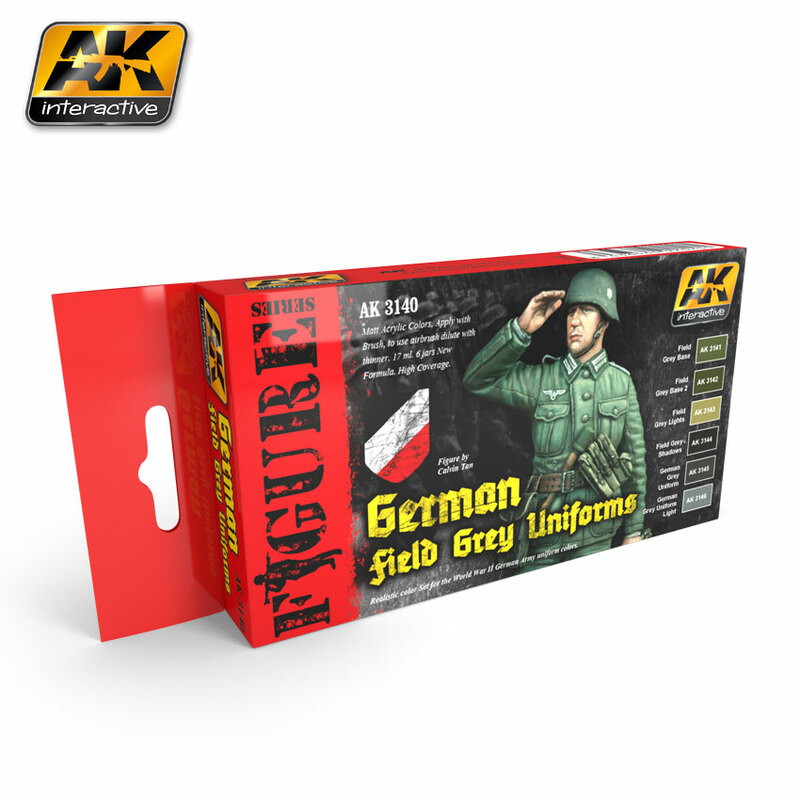 Your figures deserve to be treated like works of art; AK offers the widest range of specialty acrylic paints for uniforms and figures of any era. Our strict formula contains the highest quality pigments, and has been strictly tested under all conditions by the best modelers. 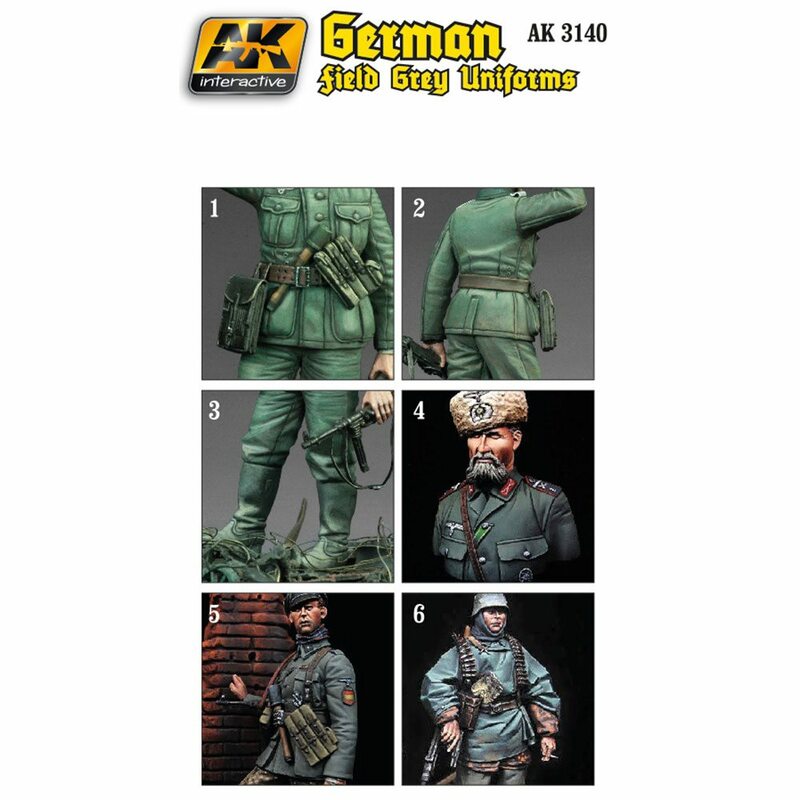 Resistant to light, AK paints offer long lasting durability for your scale figures. Paints are matte, of extremely high quality, and their covering and drying abilities are designed to maximize your potential for figure painting. High quality results with little effort or complication. Our figure series paints can be applied by both brush and airbrush. When airbrushing we recommend diluting with 40% AK 712 thinner Tap water can be used; however, we recommend our specific thinner AK 712 for best results.